Gozer Games has had some success and great reviews for our first card game, Zombie Ninja Pirates (it just won the Toy Man 2010 Award of Excellence). Now, we are announcing the launch of a new similar game, with Vampires, Werewolves, Witches, and Fairies. 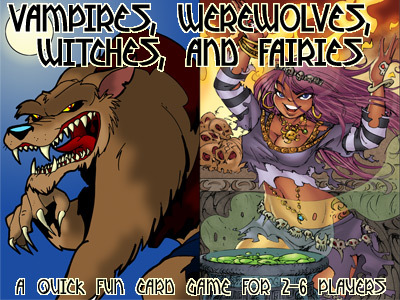 Vampire Werewolf Fairies is a quick fun card game for 2-6 players on its own. Or, it can be combined with Zombie Ninja Pirates and played with up to 10 players. We are using KickStarter to help us get this game published. The way it works, you can go to our KickStarter project page and pre-order Vampire Werewolf Fairies. Or, if you would like to contribute some more to help fund the project, you’ll get some additional bonus items which are really special. If we don’t reach our goal to get this game published, you won’t be charged at all. If we do (and we hope that we do! ), you will be one of the first people to own a signed copy of this great game. The game contains 108 high quality poker size playing cards and instructions. The game is intended for ages 13 and up, though in demos we’ve seen kids as young as 8 pick up and play the game. It takes only a couple of minutes to learn how to play, and a game typically runs about 20-30 minutes. There is enough luck, strategy, and fun however to keep people wanting to play again and again. We are really excited to announce these amazing, award winning artists for this game. Phil Foglio has been in the industry for years and most recently won the 2010 Hugo Award. He is best known for Girl Genius and What’s New with Phil and Dixie, and he has created the Witch character. Terry Moore won the Eisner Award for Strangers in Paradise, and is currently working on Echo. He created the Fairy art. Randy Milholland is the creator of Something*Positive, which has won several Web Cartoonist’s Choice Awards. He made the Werewolf artwork. John Kovalic is no munchkin when it comes to gaming artwork. He is best known for Dork Tower and Munchkin, and has created a special version of Gilly the Perky Goth as the Vampire card. Last but certainly not least, the same great artist, Cannes animation finalist Neko Pilarcik, is returning to create the majority of cards in the deck. The money raised now will go towards paying for the artists, manufacturing costs, production, and shipping of the copies of Vampire Werewolf Fairies. Gozer Games needs a minimum in order to keep the costs down and make this game reasonable to produce. We really want to get this game into your hands, and pre-ordering now is the best way to make sure that this happens. Like with Zombie Ninja Pirates, this game will retail for $17.95. At the $20 sponsor level on KickStarter, you will get one of the first copies of Vampire Werewolf Fairies, signed by the creator and primary artist, including shipping within the US. At the $35 sponsor level, you will get both a copy of Vampire Werewolf Fairies, and Zombie Ninja Pirates, signed by the creator and primary artist, including shipping within the US. This will let you combine both decks into one game. At higher levels, you will get these games plus some additional items that are pretty special. At the $50 level, you will also get a tshirt. At $100, you can get a large print of one of your favorite Action or Object cards, your choice, suitable for hanging or framing. And at $500, you can get an original piece of art from the game, signed by the artist, Neko Pilarcik. Every little bit helps us reach our goal! Please spread the word to your friends and family, on Facebook, Twitter, and LiveJournal, in gaming stores and online. We want Vampire Werewolf Fairies to be a big success, and with your help, it will be!